"The [Bush] administration has squandered the opportunity to eliminate al Qaeda....A new al Qaeda has emerged and is growing stronger, in part because of our own actions and inactions. It is in many ways a tougher opponent than the original threat we faced before September 11, and we are not doing what is necessary to make America safe from that threat." No one has more a "The [Bush] administration has squandered the opportunity to eliminate al Qaeda....A new al Qaeda has emerged and is growing stronger, in part because of our own actions and inactions. It is in many ways a tougher opponent than the original threat we faced before September 11, and we are not doing what is necessary to make America safe from that threat." No one has more authority to make that claim than Richard Clarke, the former counterterrorism czar for both Bill Clinton and George W. Bush. The one person who knows more about Usama bin Laden and al Qaeda than anyone else in this country, he has devoted two decades of his professional life to combating terrorism. Richard Clarke served seven presidents and worked inside the White House for George H.W. Bush, Bill Clinton, and George W. Bush until he resigned in March 2003. He knows, better than anyone, the hidden successes and failures of the Clinton years. He knows, better than anyone, why we failed to prevent 9/11. He knows, better than anyone, how President Bush reacted to the attack and what happened behind the scenes in the days that followed. He knows whether or not Iraq presented a terrorist threat to the United States and whether there were hidden costs to the invasion of that country. Most disturbing of all are Clarke's revelations about the Bush administration's lack of interest in al Qaeda prior to September 11. From the moment the Bush team took office and decided to retain Clarke in his post as the counterterrorism czar, Clarke tried to persuade them to take al Qaeda as seriously as had Bill Clinton. For months, he was denied the opportunity even to make his case to Bush. He encountered key officials who gave the impression that they had never heard of al Qaeda; who focused incessantly on Iraq; who even advocated long-discredited conspiracy theories about Saddam's involvement in previous attacks on the United States. Clarke was the nation's crisis manager on 9/11, running the Situation Room -- a scene described here for the first time -- and then watched in dismay at what followed. After ignoring existing plans to attack al Qaeda when he first took office, George Bush made disastrous decisions when he finally did pay attention. 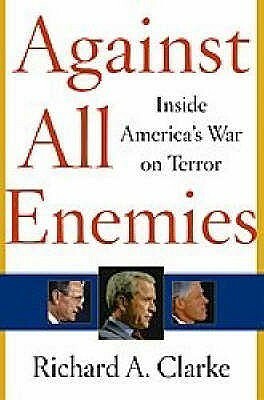 Coming from a man known as one of the hard-liners against terrorists, Against All Enemies is both a powerful history of our two-decades-long confrontation with terrorism and a searing indictment of the current administration.